Seborrheic Dermatitis is a very common skin disorder that causes greasy, white flaking, or crusty, yellowish scales and mild redness of the skin. It most often affects the scalp. In adolescents and adults, it is commonly known as "dandruff." When infants are affected by seborrheic dermatitis; it is called "cradle cap". 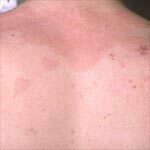 Seborrheic dermatitis can also affect the skin of the face, nose, eyebrows, ears, arms, trunk, legs and groin. Itching can occur, but is usually painless unless it becomes infected. It is usually worse in the winter months. The exact cause of seborrheic dermatitis is unknown. Seborrheic dermatitis might be provoked by a fungus, called Pityrosporum ovale. This naturally occurring organism is normally present in the skin, but sometimes multiplies, resulting in the skin disorder. There are aggravating factors that can worsen the condition, such as hormones, psychological stress, fatigue, obesity, and weather extremes. Treatment for seborrheic dermatitis depends on the person's age and its location on the body. For adolescents and adults with dandruff, treatment with shampoos containing tar, salicylic acid, or zinc will relieve mild cases of scalp seborrheic dermatitis. Infants with cradle cap can use a mild shampoo that contains tar. More severe cases of seborrheic dermatitis located on the skin will require stronger treatments with topical steroid lotions.